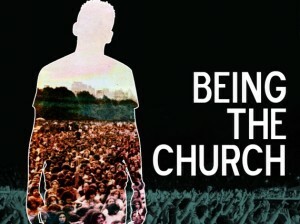 In this post, Sam Riviera continues his series of posts on how to be the church in your community. He asks what it looks like to proclaim the Gospel to your neighbors. Should the church proclaim the Gospel to the community? Does the church need to teach the Bible and even correct theology to the community? Are sermons and Bible studies the best way to do these things? Are they the only ways to proclaim the gospel? We have discovered that there are other ways to proclaim the gospel to your neighbors. For example, today I spent the afternoon at my neighbor’s house, trimming, mowing grass, sweeping, watering and other similar chores. This neighbor has been out of town for several months, spending time with his family after the death of his wife. Almost everyone on his block knows that my wife and I have been taking care of his house and yard while he is gone, and that we spent time with both of them on a regular basis after her cancer returned. Many of them wave as they pass us while we’re working, and some stop to talk. Today at least a dozen neighbors drove or walked past as I worked. Several stopped to talk. I greeted them, and they asked me questions. They asked when our mutual friend is returning and how he is doing. They thanked me for helping him and keeping the house looking nice. They asked about prayer, and prayers ascending to God. They asked about why God lets bad things happen to good people like our friend. They told me that when our friends needed someone, they believe God sent us to be there for them and wondered if God will do that for others. 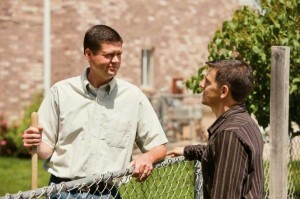 I discussed and commented on all of these issues, issues that the neighbors wanted to discuss. Some of these people are not followers of Jesus. One told me she is a Buddhist. Then she asked more questions about Jesus and Christianity. The pastor of the last institutional church we attended told me he doubted that more than two or three people remember much of anything from his sermons one week later. On the other hand, these neighbors are watching and listening to our “sermons” of love, are remembering and are asking questions. There are many ways to proclaim the Gospel. The good news can be taught in many forms. Sermons can be shown as well as preached. Somewhat accidentally we have discovered that people watch, listen to, remember and want to discuss “sermons” of love, “sermons” that indeed proclaim the Gospel. Do you have examples to share of sermons of love you have “preached” or have seen or heard “preached”? Can you think of ways to proclaim the Gospel using something other than just words? There are those who say, those who do, and those who say and do. Those who say and don’t do aren’t living out what they say. People can see right through that. People who do and don’t say may receive thanks and glory for doing things they believe Jesus wants them to do. They may or may not receive the glory that belongs to God alone by not doing these things openly in the name of Jesus who is the author of the good works He ordained that we should walk in. The people may not know if they are Christians or not, maybe they are just nice people. Maybe they find out they are Christians, but they may know people from other religions who are just as nice and maybe even nicer. Then there are those who say and do. These are people who talk about Jesus as if He was present with them all the time in the course of casual conversation. They are motivated unto love and good works because of the Spirit that works in them both to will and to do God’s good pleasure. They, like Jesus, make the most of every opportunity to give the gospel message along with special acts of service. This may not make them popular but it’s not because they are not loving towards them but because the name of Jesus is always on the tip of their tongue. I could be way off base. You may think that I am unloving. 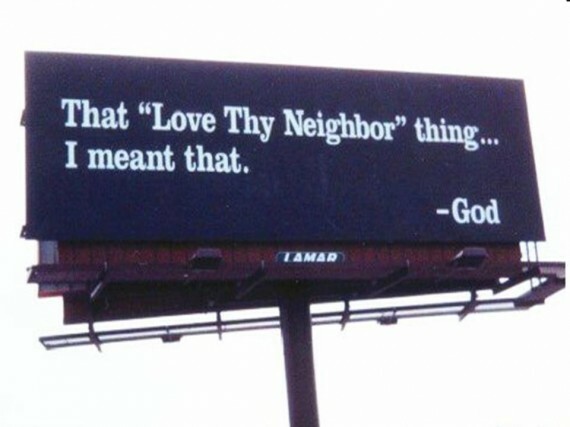 I love Jesus and He loves my neighbor through me, I think it is only appropriate if I share that up front. God is love. He is the author of it in my life and I want Him to receive all the glory. I hope this is not taken as condemning. It may feel that way or this may seem like a cheap shot. There are few people I have known for very long that I haven’t shared my faith with. I will admit that sometimes it takes me a while to work up the nerve to talk to them about it but the Spirit always seems to be prompting me to bring Jesus up in the conversation. Often though it is quite natural for me to bring Him up. I believe this is common when I am walking in the Spirit(no effort on my part) instead of walking after the Spirit(a struggle between the Spirit and the flesh) any way take this or leave it. I mean no disrespect. Hi Shawn. Yes, we can share Jesus both in what we say and in what we do. If we don’t follow up what we say with acting in love, no one believes what we say. Sometimes showing love provides an opportunity to speak. A little story: The group of homeless men called us over to them. Talk and discuss we did. It went very well. We don’t share the particulars because that’s their story. Maybe I can explain it this way: If you thought you were having a private discussion with someone and then discovered that they wrote it out and put it on the internet, wouldn’t you feel betrayed? Yes, the Jesus story is both Show and Tell. I see. I believe it can work both ways. I try to stay who I am in Christ. Not so easy. Trying is the problem most of the time. I have experienced personally discussions and witnessing turn into friendships. Having people over for dinner. Becoming actual friends and through that relationship doing them good and knowing through sharing Christ. And many times it is talking then doing. Sometimes the other way around. Following the leading of the Spirit often leads to speaking of my best friend Jesus. But in order to have the opportunity to speak to people and share the gospel going about doing good is the way. Be blessed. I retired as a mechanical engineer some years ago. I determined to be intimate with Jesus. As my personal time with Him increased, opportunities to share Jesus just showed up. No trying on my part, but because of significant time with Him, I was always ready. I learned that everything starts with spending significant time with Him, first. Intimacy with the Lord (or anyone) doesn’t happen with some 5 minute chats.